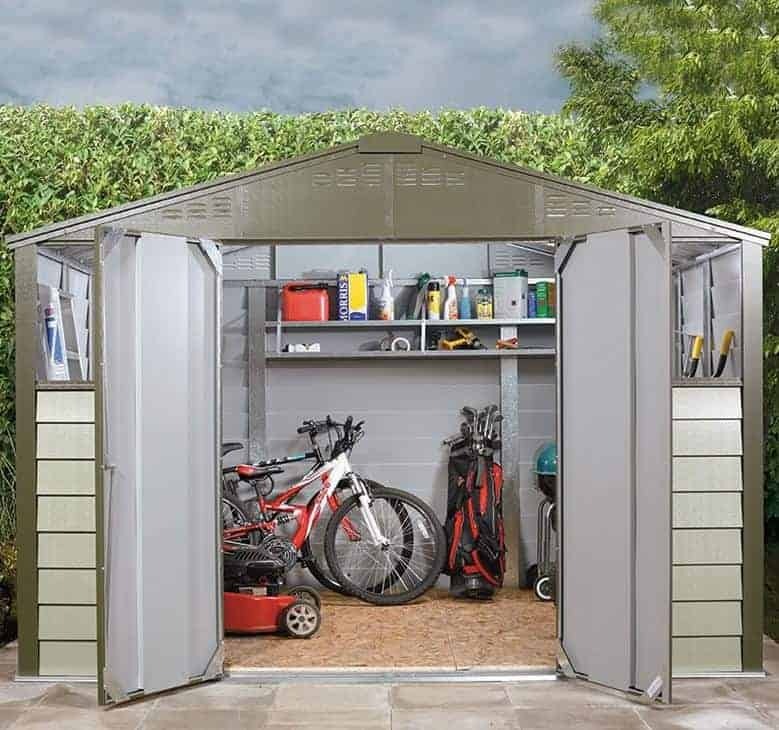 This is the largest metal shed within the Trimetals Titan range, and that makes it a very versatile garden building. With the inclusion of two windows as standard, and ventilated gables, it’s a bright and airy space to spend time in which is why we can imagine it being used as a small scale workshop. As the metal cladding is fire resistant it’s also an ideal place to store flammable goods. The cladding is not only fire resistant it’s also very rain resistant thanks to its three tough layers that made it noticeably thicker than most cladding that we see. This rain resistance is also helped by the tall apex roof which carries water harmlessly aware. Thanks to these factors, the manufacturer has been able to supply a very generous 25 year warranty against rust. 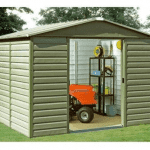 Whatever you use this two tone metal shed for, the likelihood is that you’re going to have some items of value stored within it. That’s why we were pleased to see that a secure key operated locking system is included with the wide opening double doors, but there are also optional extras available that can make it even more secure and that give added peace of mind. 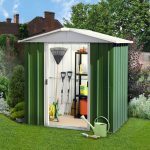 We’ve reviewed a lot of metal sheds, and yet this has a look all of its own. The first thing that made it stand out was its two tone colour scheme, and there’s not a metallic silver or grey in sight. The olive green frame and doors contrast nicely with the almond white overlap style panels, and the result is a metal shed that’s attractive as well as being functional. The other differentiating feature at first sight is the inclusion of two windows beneath the eaves. 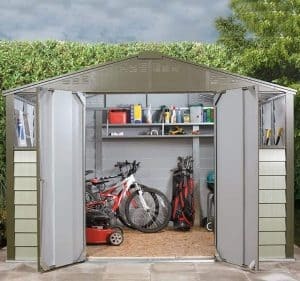 It’s something we rarely see on metal sheds of this size, and means that it can be used for more than just a secure storage space. At the summit sits an apex roof, which we always welcome on metal buildings as it means that water isn’t allowed to sit on the surface where it could potentially cause rust. It adds important height as well, giving a ridge height of 2.20m although the eaves height of 1.74m is lower than some we see. 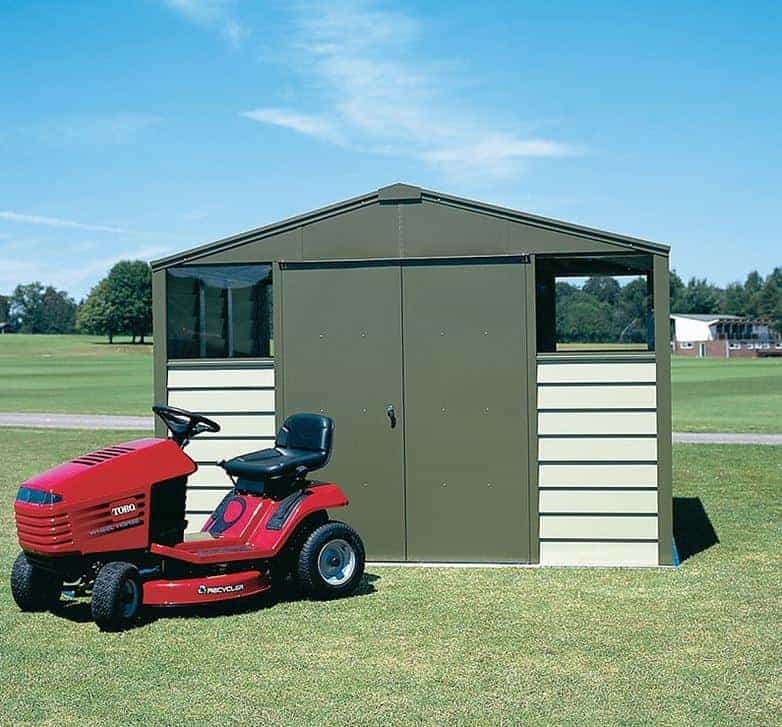 When deciding where to site the shed, you’ll need to know the overall width of 3.01m and the overall depth of 2.43m. We were pleased to find that galvanised metal was at the heart of the cladding as this is both lightweight and strong. It was even more pleasing to see that it had then been given a PVC coating that effectively keeps water out, and finally covered with thick coats of paint. This makes it significantly thicker than most metal cladding that we see, and once assembled the shed feels very stable and reliable. It should also be noted here that the cladding is fire rated to class 0 and 1, so you won’t have to worry about the storage of items such as paints or petrol. There is no floor included as standard, so you’ll need a level area of concrete that measures at least 3.01 X 2.43m. There is, however, the option to add a wooden floor, although this comes at a price of £134.99. Just how effective the tough cladding is at stopping rain penetration, which can be a major cause of rust, is shown by the manufacturer’s provision of a 25 year guarantee against perforations resulting from rust. This is as long as any that we see, and should give real peace of mind to anyone making what is after all a significant purchase. 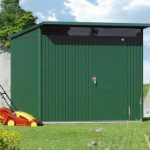 As with all painted metal sheds, there are no treatment requirements for the customer, so once it’s assembled they can relax for at least a quarter of a century. We liked the way that the olive green paintwork on the double doors stood out against their surroundings, but what we liked most of all is that they open to a width of 1.39m. This makes it easy to move even wide objects in or out, although we would have liked them to be a little taller so that bending down wouldn’t be necessary when using them. We were very pleased to find two windows included, and being positioned high up on the shed they don’t compromise security by making it easy for passers by to see what’s stored inside. It means that the interior is very light on a sunny day, and thanks to the inclusion of vents on the gables there’s lots of fresh air too. That makes this one of the most comfortable environments to spend time in that we’ve see on a mid sized metal shed. Acrylic glazing is used for the windows, which we were glad to find as it’s much tougher than standard glass and a lot more shatter resistant which means that it can act to enhance rather than detract from the shed’s security. The security feature we liked most of all however was the inclusion of a strong key operated lock, making the double doors as secure as any on your home itself. Whilst we were impressed with the security features that have been included as standard, we were pleased to see that they could be enhanced still further as we know that many people are very concerned about reports of shed break ins. For £24.99 an infrared burglar alarm can be added, and there’s also a free option to have a fully boarded effect without any windows which effectively turns the building into a security shed. Alternatively there’s the option to add an extra window for the cost of £35.99 which we feel is ideal for people who plan on using the building as a workshop. The immaculate paintwork is just one sign of the high quality that we found provided by the shed as a whole. Galvanised metal is very tough and durable in its own right, but the addition of PVC makes it even more long lasting and weather resistant. 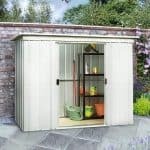 This is very much a mid sized metal shed, although we would have liked to see more height provided. It was good to see that all fittings and fixtures are included, including stainless steel fixing screws, so with a friend’s help this can be assembled in around six hours. 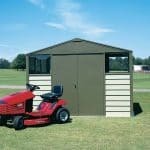 We found a lot of positives to this metal shed, yet we have reviewed much larger examples that come at a lower price. 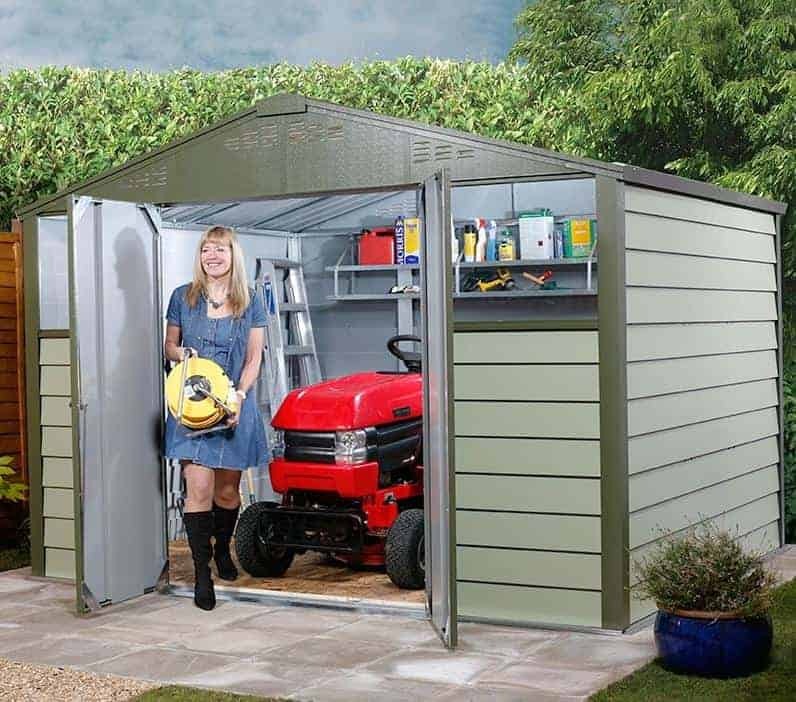 Final Thoughts: Just because you have a metal shed doesn’t mean that you have to have a building that’s a dull silver or grey in your garden. We found the green and white colour scheme pleasing to the eye, and once we got to know it better we found a lot of other features that we liked too. Perhaps the most significant of these is the thick galvanised cladding that’s coated in PVC and paint. 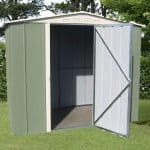 It’s half as thick again as much of the cladding that we see, and this is one of the reasons that the shed comes with a very generous and reassuring 25 year warranty against rust damage.